This cereal reminds me of jogging in an interesting neighborhood. As you put on your sneakers, jogging is about the last thing you want to do. But as you hit the pavement, you're like, "This isn't that bad." As your run progresses, you start to feel increasingly proud of what you're doing. You even start to have fun. You're running through a neighborhood with a lot of interesting things to see. Look! There's a shirtless man getting his mail. He's so chubby! For a minute, you just take in the scenery and forget that you're doing something healthy. This morning as I poured the new All-Bran cereal in my bowl, I couldn't help but stare longingly at the other cereal boxes in my office. Words like "chocolate" and "berry" suddenly seemed to be larger and almost three-dimensional. By contrast, the bran flakes in my bowl seemed boring and... ugghhh... healthy. As I dipped my spoon into the cereal, I took solace that I was about to get 40% of my daily fiber requirement... no mater how lame the taste might be. The flavor and feeling of the flakes are familiar. They're health food flakes and they taste like it. Personally, I like the flavor - if only as an occasional change from sweeter cereals. But they're old-school. You can imagine the Kellogg brothers in 1890 tasting the same flavor as they experimented with healthy cereal flakes. The spoonful of All-Bran Yogurt Bites that appears on the cereal box is deceptive. The picture is loaded with tiny yogurt-coated oat clusters. In truth, you get about one or two of the clusters in each spoonful. That's better that a lot of other cereals promising something new and flavorful in each bite. The good news is that these little clusters add pizzazz to the fiber-rich cereal. Taken alone, the clusters taste like tiny oatmeal cookies. There's hardly enough clusters to completely change the personality of the cereal. But there are enough to make the cereal slightly more exciting. I tend to add a teaspoon of sugar to the original All-Bran cereal. I didn't feel the need to do that with this new cereal. So like a jog through an interesting neighborhood, I finished my bowl of All-Bran Yogurt Bites. I had a good time and, at one point, I forgot I was eating healthy. Later this afternoon, I look forward to being more regular. I suggest that you jog down to your local grocery store and pick up a box. What do you think of All-Bran Yogurt Bites? 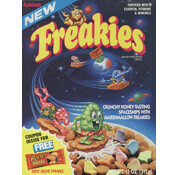 Still hoping they re-release this cereal. It was, by far, my favorite of the "healthy" cereals. Where can I buy this product in Charleston, SC 29466 or Atlantam Georgia?? My son loves it! 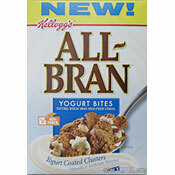 WHAT HAPPEN TO THE ALL BRAN YOGURT BITES... This is YOUR BEST Cereal!! You will be losing buyers if you don't bring the Yogurt Bites back!! LOVE THIS STUFF and it's GOOD for you TOOOOO!!! I can not find Kellogg's All-Bran anywhere. Can you tell me where I can buy it? This cereal is SO GOOD! But I can't find it lately? Anything I need to know? Did they stop making the yogurt bite brand? I cant find it in any stores. Bought my first pack of Allbran yogurt bites abroad, but cannot find it in my local (Tesco & Sainsbury) supermarkets. Where can I buy it in Edinburgh? Yogurt Bites is absolutely my favorite cereal! Yes, this cereal can be expensive, however it is well worth it. Several months ago I started eating it every day. I mix it with yogurt as I do not like milk. It keeps me full until lunch because of the high fiber content and has kept me regular as well. Two thumbs up. I am able to find it lots of places. Wal-mart in my area even sells it. Great option to get daily fiber. Tastes really good. My only complaint is that I cannot seem to find it in the stores as often as I once did. Can you tell me the carb and sugar count of this cereal? How does this compare to Total Vanilla Yogurt? The price here in Connecticut is $4.58 a box! I can't find the cereal anywhere. Suggestions? As health food goes its very good. The yogurt chunks are kind of gross but you can probably get your kids to eat it (trust me I'm 11). The texture is good. I am a fan of your website. Congratulations for the work. I understand that each individual has your particular sense of taste, so not everybody agrees with your products reviews. I haven't eaten the Kellogg's All-Bran Yogurt Bites, however since your review emphasizes it is a healthy cereal I do think it is important to point out that if you read the ingredients list you will learn that it contains Partially Hydrogenated Oil, it means it has Trans Fat (less than 0.5g/serving so its label can display zero Trans Fat though). Additionally half (1.5g)of the Fat per serving (3g) is Saturates Fat. Again, since the review strongly highlights the healthy benefits of the cereal, I think these facts should also be mentioned. Another suggestion: you disclose the price you paid for reviewed cereal boxes. You should also mention the size of the box.